This post about the noise level in a kids yoga class has really touched on an important topic. As we develop our style as a teacher we will also develop our own guidelines for what is acceptable and what is not in our classes. When we go out and teach, not everyone will like those guidelines! We also decide which of our guidelines we are willing to change and when to move on to find those who do appreciate our philosophy as a kids yoga specialist. Who to Connect With? One teacher didn’t like that I used the words Universe and Infinite, and thought I should say “God.” That was early in my teaching years when I was deliberately not saying “God” so I wouldn’t offend anyone. I learned you can’t please everyone! Noise Level in the Class: In a different class the teacher kept jumping in to quiet the kids down. I didn’t have a problem with the noise level. Later that week they called and canceled the rest of our classes saying yoga “wasn’t really working” with their kids. Thank you for your insight. 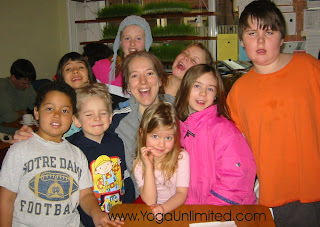 I was teaching yoga in a class room setting and the kids ages 7-9 were having fun and being kids and I was having fun! Then the director of the private school came in and started to discipline the kids telling them, yoga’s quiet and relaxing, and proceeded to tell me how I need to discipline them more! I felt like the kids…………………. like I’d been caught and now I’m in trouble!!! I cringed at the thought. I really didn’t know what to say!! She is the boss! so the rest of the class had a stifling quality! I felt badly for the kids because we were having fun. I haven’t been back and I have shied away from teaching kids in school settings thinking I’m not the type who wants to be this harsh task master telling them to control themselves!!!! I’ve taught many art classes where the clay is flying and the paint is everywhere, they were the most fun and most expressive. Thank you for your insight the next kids class I teach I will tell them before hand this could get to be loud with lots of laughter and sound! Thank you have have a great day! The teacher or parent sets the tone for what is acceptable and what is not. We’ve all seen kids ask daddy because mommy said no! Kids are very intuitive and they quickly figure out who will let them do what. The same applies in the classroom. Teachers are surrogate parents for kids while their parents are away. Just like parents, they need to agree on what is acceptable in the classroom. Obviously certain rules are no-brainers like the rule: No Running with Scissors. But other rules are not so obvious. To mommy, jumping on the couch is dangerous. To daddy, it is fun. At some point mommy and daddy have to work out an agreement on whether the kids can jump on the couch or not. Then consider, jumping on the couch at home with a couple kids may indeed be fun, but in the classroom I can guarantee eighteen children jumping on the couch will lead to problems! Ask the teacher if the classroom rules are posted anywhere. If you are a visiting teacher it will be useful to support the rules instead of making up a new set on your own. Useful because the kids will know these rules and it will help you a lot with classroom management. A classroom or daycare teacher has a large group of children for five days a week, up to eight hours a day. This is very different than teaching an hour long class once a week. If kids are loud all day – the teacher will be burnt out before too long. Believe me, I’ve had many burnt out teachers in my adult yoga classes. In almost every school I’ve visited, classrooms have a calm and controlled indoor atmosphere. When kids are outside they can run and yell and jump as much as they want. Once you’ve been in a few classrooms you get to understand the general noise level that is acceptable. It is easier to teach a class who can be quiet and respect the boundaries. If the kids don’t have boundaries they often interrupt and talk while the teacher is talking. Are the kids loud and yelling because they are taking advantage of you as the new teacher? Or does the exercise or game call for this Spirited Expression? If I’m doing a game that is on the loud side I usually warn the teacher before, saying, “OK Teachers – cover your ears for this part, these lions can roar pretty loud!” Plus I let the kids know what the quiet signal will be. Part of your teaching style should included a way to quiet the class quickly. If a teacher frowns upon the noise being made – then your yoga style may not be a fit with that classroom. Each teacher needs tools and games to quiet the class quickly for when the noise level escalates (and it can escalate quickly). 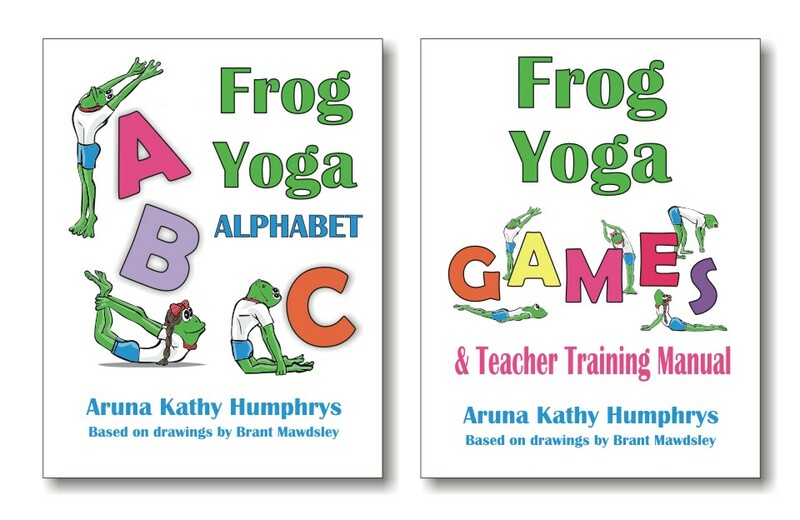 You’ll learn these in most Kids Yoga Teacher Training courses but you can also find ways in many books like here. It also helps to end the class with a relaxing and meditative activity so the kids leave settled. Handing the teacher or parents a group full of hyped up, noisy kids will create resentment. Like the kids, we use our intuition to tune into the culture of each group. We will connect with many classes and some we will walk away from so they can find the teacher that does connect with them. “The biggest stumbling block for a successful life is dependency on conditions. and generates more thoughts of dependency on substance. For many teachers, there comes a time to choose a style and through deep meditation to understand who we want to be as a teacher and a leader of children. Whether you want to be strict or loose, loud or quiet, serious or playful – we decide who we will be and no one else. If you don’t come to this point you spend much time trying to please everyone – what a struggle you are in for! No matter how many supporters we have, there will always be someone who will complain. So in the end, we must develop our own style and then enjoy the consequences. Those who you work with will appreciate you, those who don’t appreciate you, you won’t work with. P.S. Kids Yoga Teacher Training – I invite everyone to join me to learn some tools that will help you develop your teaching style based on the Timeless Wisdom passed down from the Yogis. You may be surprised to find out how easy it is to use yoga tools, meditations, and games to help kids calm down in the classroom. Details here. Excellent article! I agree that we should focus on having fun with the kids and not try to fit into someone’s preconceived notion that yoga should be quiet and relaxing. I just want the kids to enjoy practicing yoga and hopefully want to continue for life. I think a good class is a balance between activity and quiet. There are plenty of poses to quiet them down in between the different active asanas, such as Mountain (Tadasana) or Mouse (Balasana). The kids know that mice and mountains are very quiet. But they really love the very active poses and games we do!